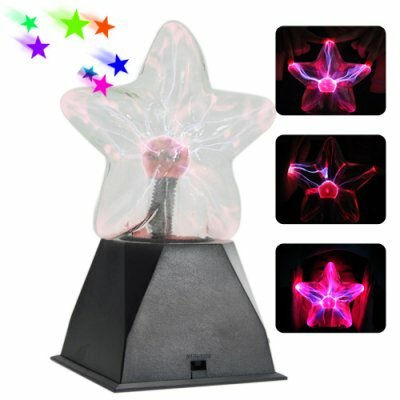 Successfully Added Electric Plasma Star with Touch and Music Response (220V) to your Shopping Cart. A Plasma shaped Star in time for Christmas, transform the mood of your favorite room with this simple plug and play plasma Star that creates a very cool ambient atmosphere. This Plasma Star shaped ornament comes with two mode features, (1) static i.e. leaving it on for constant play, or (2) switch it to audio mode and place it next to your speaker. Once the vibrations from the base of the music hits this Star shaped plasma ornament, the electrifying blue lightning bolts starts to dance to the music. Once the Blue lightning bolts hit the inner surface of the plasma star, it transforms into a shady red/pink color, providing you with a dazzling display. The CVGZ-G160 simply creates an enjoyable atmosphere for both you and your guests. The Plasma Star is not just sound sensitive, its touch sensitive too! Just place your fingers on its outer surface and watch the electricity bolts follow your every move with a cool electric Red color effect. The CVGZ-G160 is the perfect decoration for any part of your house. Place a few in your bedroom to add a little kick to your night life! Or impress your friends and place some next to your entertainment center for your next big get-together. The Plasma Star is great for parties too! The fascinating blue electricity is the perfect way to keep the crowd energized and going strong all night long! The possibilities are limited by your imagination only. This great new gadget is guaranteed to keep your energy level high whether you are working or playing. Buy a few today as the perfect holiday gift or resale item, and don't forget to purchase some for yourself as well! This product is in stock and ready for immediate shipment, straight from the leaders of factory direct wholesale electronics, Chinavasion. This product is only for use with 220V electrical currents. Is the Plasma Star visible during the day time? The Plasma shaped Star ornament visual effects can be clearly visible during day time. Is there any risk to my health by touching the Plasma Star, or simply by being near it.? No, it is completely safe to touch the plasma Star. There is no risk at all to your or anyone's else's health from the plasma.